An interview with Rémi Bellemare-Caron of Union Communiste Libertaire (UCL) on anarchists' influence on the student movement, that of students on the anarchist scene and the prospects of the ongoing student strike in Quebec. Originally submitted at Linchpin.ca on 6th March 2012. As part of its ongoing coverage of the nearly five-month-old Quebec student strike, the World Socialist Web Site is publishing in edited form an interview it recently conducted with Jeanne Reynolds, a leader of CLASSE (Broader Coalition of the Association for Student-Union Solidarity). 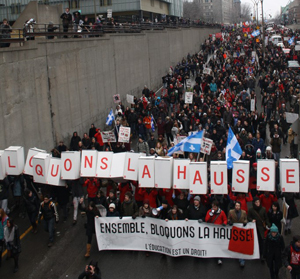 Insisting that education should be a social right, CLASSE initiated the province-wide strike against the Quebec Liberal government’s plans to dramatically raise university tuition fees. In contradistinction to the trade unions and the other major student associations, all of which are closely aligned with the big business Parti Quebecois (PQ), CLASSE has called for defiance of Bill 78—legislation that effectively criminalizes the student strike and places sweeping restrictions on the right to demonstrate over any issue anywhere in Quebec. Reynolds, a 20-year-old CEGEP (pre-university and technical college) student, is one of three official CLASSE spokespersons. Jeanne Reynolds speaks to the WSWS with another CLASSE representative (left)WSWS: The strike is now well into its fourth month. The government has clearly taken a very hard line—ultimately, police repression followed by Bill 78. Why do you think the government has been so intransigent, so hostile towards the students’ demands? Jeanne Reynolds: We knew from the beginning that it would be difficult to reverse things, because for this government the tuition fee hikes are the tip of the iceberg. If, despite everything, the fee hikes pass, the government will have greater latitude to impose all sorts of other user-fee hikes and initiate its “cultural revolution” [making the “user-pay” principle for public services the norm]. Because students, it must be said, are the population group most ready to oppose things, to go out on strike. The government’s obstinacy has almost been obscene and has caused the government to make all sorts of errors. It never seized on the occasions when the conflict could have been ended. There was an article that appeared in the [British] Guardian perhaps two months ago that said the conflict in Quebec is one of the first real threats to neoliberalism in North America. At the beginning, I thought that was a little ambitious. But now, I think that's true. We have shaken and destabilized this government. Pushed to the wall, the government has entrenched itself by resorting to the most extreme measures. In so doing, it has revealed its real face before the eyes of the population. WSWS: The strike has certainly shaken the Charest Liberal government. But the more it has been shaken, the more intransigent and ferocious it has become. This is because what is at issue is, as you say, its whole program, and this program of dismantling public services and destroying social rights is the program of the entire ruling elite, across Canada, in Greece, Spain and around the world. JR: Yes, this is a battle that we find in some fashion everywhere. But here in Quebec the struggle has taken shape through the student strike, which is more and more directed towards a popular struggle. WSWS: Do you think that if you continue the struggle in the manner that you have pursued it to date the government will ultimately be forced to negotiate and give in? JR: We in CLASSE have always had a mandate to negotiate. That is to say, if the government calls us for negotiations, good, we'll go. However, for us, this is not the principal axis of struggle. The way in which the conflict can be resolved is if they cancel the fee hike completely, or there's another possibility—the calling of elections. If they don't call elections and we can restart the strike in August [when the government plans to resume the suspended winter semester], if we can be supported by the trade union federations, by the big unions, for just a few days of massive mobilization, we will have a very, very powerful weight. WSWS: What you have just said raises many questions. First, do you think the unions will support you? They have announced that they will obey Bill 78. Second, what do you think of the support that you have received to date from the labor federations? Jeanne ReynoldsJR: We have had the unions’ formal support. But to be sure, we are far from the trade unionism that we had 30 years ago or further back. It's a unionism that is less combative, more accommodating. Will these people elaborate a plan for a social strike, which for us is something that's quite achievable? I know that there are many things that could prevent that from happening. For example, they're all sorts of rules that mean workers could lose seniority. There are two groups. There are those who don't like a social crisis—a large part of the population, including the trade union movement. For them, the moment order is disturbed, there is something wrong and it's necessary that order be restored. FECQ [Quebec Federation of College Students] frequently says: “Things have to be calmed down. We must return to social peace.” Whereas for us, when we're in crisis, that's something good. We're in a moment of ferment, of effervescence. It only makes for more important crises of conscience that can lead to something bigger, like a larger mobilization. WSWS: You spoke of elections. How could they solve things? Do you think the Parti Quebecois is a viable alternative for students and working people? JR: For us, elections are not really the way to resolve things. When they say that democracy is once every four years, that’s something that makes us grind our teeth. For us, the voice that we express when we are in the streets, that's democracy. WSWS: At the beginning of June, CLASSE and the other student associations made a counteroffer in which they accepted the government’s tuition fee hikes for all but two of seven years. Had the government accepted this proposal, do you think it would've been acceptable for the students? Wasn't this counteroffer based on the idea that there will soon be elections and that through the election of a PQ government students’ demands can be met? JR: It's more the other student federations [FECQ and FEUQ—Quebec Federation of University Students] that pushed for this idea at the negotiating table. But I do think our negotiating committee let things slide a bit. In any case, this proposal would not necessarily have been supported by the students. FECQ and FEUQ base themselves on the fact that the government must call an election some time over the next 18 months. They view the election of a PQ government as a solution. But for us, that’s not a solution. Maybe it's a short-term solution, because if the PQ takes office they really won't be in the position to maintain a hard line like [Quebec Liberal Premier] Jean Charest. The return of the Liberals would be completely disastrous for us. Whereas, it’s certain that the PQ, at this point, is much less hard-line. WSWS: But did not the PQ, when it last held office, impose, with the unions’ support, the greatest social spending cuts in Quebec history? JR: Yes, I know. That's why I told you that the ideal scenario is that the elections not be launched at this point, and that we go forward with our mobilization and break this government. And if it retreats on the question of the school fees that would mean that our governments are there not for the economic elites—they're not there to rule for the banks and big companies, for the 1 percent, they’re there to govern for the whole of the population, for the welfare of all. I think that what really differentiates the PQ from the PLQ [Liberal Party of Quebec] is the dream of independence. But, in reality, the PQ is just as much mired in corruption and collusion as the Liberal Party… The party that would most coincide with the views of CLASSE is Québec Solidaire. Although I must say, that within CLASSE there is a great diversity of political opinions—it goes from anarchism to communism and there are also social democrats. WSWS: You've spoken of a social strike. Is that now CLASSE’s strategy, and what precisely do you mean by a social strike? JR: We are caught in a dicey situation with Bill 78 as regards students’ dues. That is to say, if we decide to block classes, to mount picket lines, the government can cut off our student dues one trimester for each day [we defy Bill 78]. If we are on strike for two weeks, that means 14 semesters without student dues. If these provisions are not suspended, we say, why not go with the social strike? They won't be able to apply all of the repressive laws and, at the same time, this will be the occasion for a massive mobilization, precisely to break all of these austerity policies. That's what we have envisaged. For the summer, we’re planning conferences around Quebec to make known our demands and discuss the social strike. We will write a manifesto with our demands to directly address the people. It will be like a message to the nation. One thing is for certain. If we want a social strike or days of massive mobilization, it is necessary to go to the rank-and-file workers. We can't go to the presidents of the labor federations and ask them to advance our mandate for a social strike, because we know they won't do it. It's necessary to pass through the rank-and-file workers to convince them why it's necessary to do this. They are the ones who will take this forward, who will place pressure on their elected officials. But it's not a simple task and I acknowledge it's not clear how things will turn out. I don't think we will get an unlimited social strike. Perhaps a few days, but not something long-term. WSWS: Will this be a strike with the perspective of bringing down the government? JR: I think that it will be to break this government, to change the climate: we've had enough of the politics of austerity; we have had enough of this electoral system. So obviously all this will come into play. If we’re speaking of bringing down the government, I don't think we’re going to arrive at the National Assembly pitchforks in hand. It is not with that perspective, but with the perspective that if we can change things, modify our political system, well, yes, we’ll do it. But it's necessary to convince people to join us and that is not always easy. WSWS: What do you think is the attitude of the working population, the working class, towards the strike and towards Bill 78? JR: It's not clear. Because most of the working class population, the people who work in the factories and in places like that, these are not necessarily people who are with us. There is like a new populism. I don't know if you grasp my meaning—people who want to pay less and less tax, who want to have more, who are angry with the government, but who want to buy more. I don't think the working class in Quebec really has a tough time. There are factories where people are very, very well-paid, so well-paid that, let us say, the culture of the big car and the big house is very implanted. One has to beware of this notion of class struggle. I think things have really changed. I would say that there is a section of the poorest people who, yes, are with us. But they are not interested in politics. The middle class, I would say the middle class is very much there. Also, there are bourgeois people who have values like those we defend and who come out in the streets with us. One really has to be careful with classification. WSWS: The situation is very different from how you present it. Over the course of the past 30 years there has been a dramatic decline in the social position of the working class—a vast increase in social inequality and economic insecurity. The top 10 percent and especially the top 1 percent have reaped virtually all the revenue gains, while workers’ wages have stagnated or declined; the tax burden has increased even as public services have been bled white. JR: Do you know anything about the conflict at Rio Tinto Alcan? I know many people from Alma [in northern Quebec] who say that the workers who work at Rio Tinto Alcan wouldn't be with us if they weren't themselves currently locked out. Because these are the people who really control the wealth of that region and who have big cars and big swimming pools. In my region, Salaberry-de-Valleyfield [an industrial town in southwestern Quebec] there have been several plant closures, and the workers who have been put on the street find themselves with many problems because they bought $300,000 homes and went into debt. I don’t know if you realize the rhythm of life has changed. WSWS: In Quebec, as across Canada and around the world, workers have been systematically betrayed by the pro-capitalist trade unions and the “left” parties of austerity, like the social democratic NDP. We believe that the way forward for students is to recognize that the working class is the only social force with the power to radically reorganize society so as to secure the basic social rights that capitalism will not and cannot provide. We fight for the student strike to become the catalyst for the mobilization of the working class across Canada and beyond, in defence of all public services, jobs and worker rights, and against big business and its political representatives. JR: We are contesting everything to do with user fees and the privatization and commercialization of public services. But it is not necessarily evident, because the mass media always want to restrict this to something small, to something narrow, perhaps to preserve the system. I don't know really why they do this, but it's what we feel. Frequently people say, “Why didn’t you speak of that?” But we do. That's why we want to publish a manifesto. We started this strike over the question of the tuition fee hikes, but it has gone so far beyond the struggle that we began that I think we are now in over our heads somewhat. People keep saying “Why don’t you do this?” At a certain point, these people need to come to our aid. WSWS: What do you think is the international significance of what has taken place here over the past four months? JR: Many people have been influenced by all the struggles that are taking place internationally: the Arab Spring, Occupy, etc. The strike that we have carried out shows that we can make changes by acting directly in our milieu, not simply by crossing our fingers and waiting for another party to take the power. Change is brought about directly, by people going into the streets, by economic disruption. Everywhere people are mounting struggles and the struggles are influencing one another. If everybody starts doing this, we’ll be able to make changes and act differently. EDIT: here's link to original article: http://www.wsws.org/articles/2012/jul2012/inte-j07.shtml apologies for the original ommission.